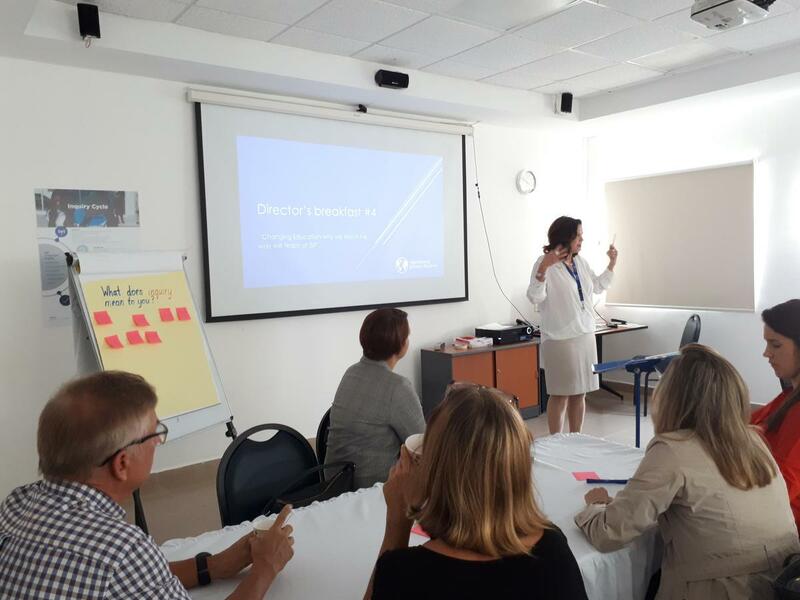 Director's Breakfast: Changing Education - Why We Teach the Way We Teach at ISP. This week Director Viki Stiebert met with parents to discuss ISP's approach to learning. We sat down for a chat to reflect on the experience . Why did we start having the Director’s Breakfasts? If a child is healthy all through their life until they are 18 and go to school every day, they will spend 20% of their time with us and 80% with their parents. Parents are the primary educators and key partner throughout our learning adventure. So I don't think we can work closely enough with parents on creating a common vision and a common expectation. These director’s breakfast creates an avenue for me to have face to face interactions with parents, helping enrich the educational experiences and choices we offer even further. On this occasion, you talked about changing the way we learn, what was the experience like talking to parents? I didn't really know what to expect. When I got to school (two years ago) everyone had a different vision of the school and of the way we teach. If you review our strategic plan you can see a combination of conceptual learning, inquiry-based learning and traditional learning. Although these are all important components, we acknowledge the need to develop a common and shared understanding of learning at ISP. When we look at videos such as the one we showed the parents, about making shift happen, (click here to watch the video) we begin to acknowledge and accept that the world that we are educated for, the knowledge world, is changing. We need to shift our own mindsets about education towards an understanding that we are now responsible for preparing students for an ever-changing world which values the creation of knowledge rather than the accumulation of knowledge. That can be scary, even causing some anxiety for parents and teachers. We know change is never easy, but if we work together, we can make this shift happen in a supportive and collaborative environment. Realizing the need for more consistent expectations and creating consistency in our approach to learning, we started working with teachers focusing our thinking on inquiry-based approaches. Giving our teaching staff ongoing opportunities to engage in inquiry and in groups to help shape a common understanding of how we are shifting the way we learn as teachers and in turn, the way our students learn, every day and in every class. I shared some of the apprehensions in acknowledging this shift, and also that I didn’t know what would happen when we spoke to parents about these changes. As most of our parents grew and were educated in a knowledge-based system, which is also true for most of our educators. We are all used to the structure of learning content and then validating what we learned in a test. Although this is important, it is no longer enough to adequately prepare students for the world ahead. The shift in thinking which we witnessed within just one hour was phenomenal. Our parents are amazing! It was clear that the parents present reached the conclusion that a different educational approach is needed moving from the knowledge to the creation of society. They acknowledged that this is also is why they have chosen ISP. A parent at the end spoke about putting faith into the school and the importance of accepting that your child may do things in many different ways and that this is ok. The shift is happening, things are changing and none of us quite know where it's going and we are doing the best we can using research-based pedagogy to prepare our children for that reality. Hearing that from parents was phenomenal. Two Seniors came and presented their Science and Engineering projects, how was that received? They exceeded everyone's expectations! I think anyone who sat there listening, educators or parents alike were thinking ‘ what incredible young people these are’, and’ how fortunate we are to be educating them’. They were so positive, joyful, passionate when talking about their learning. You could see they have the skills to cope with whatever is going to happen in the future, as well as the flexibility to adapt to a changing world. What's the advantage of having a Teaching and Learning Team? Our Teaching and Learning Team is world class and they are the conduit between what research is telling us is best and the student, they are teaching the teachers to shift their thinking about the way they teach in order to meet our student's needs. They are the ones helping us put theory into practice across all divisions and academic areas. Shawn Colleary and Joel Bevans who shared part of the presentation were able to ground all changes we are making in research and best practice. What is next for our inquiry learning adventure? There certainly is tension between most educators and parents having been educated as part of the knowledge society and us educating children to be creators. It is however also an exciting time to be pushing the envelope in education. We need to educate our children to be able to do tasks that technology cannot do. Education is shifting to focus on three important aspects. One is for students to really know themselves. So that they may mindfully examine decisions they are making and the knowledge they are acquiring. The second is collaboration and that is about students having interpersonal skills to enable them to work with one another. The third is systems thinking and that encompasses the content that is being learned. How we do that as a school involves evolving our thinking so that we focus on transdisciplinary skills. It's no longer about the silo focus on subject areas. It's about self-management, collaboration, communication, thinking skills, and research. Those skills translate and are beneficial for every single academic area, and essential for success in the world beyond the classroom. At ISP that is certainly the path we are walking, and the results show when we hear our Seniors relay the experience of working on projects and achieving amazing academic results, honing essential skills such as collaboration while contributing something of value that holds the potential to change their world. Teaching is changing at ISP and you can see it both in our teacher's experiences and experiences. The coffee with parents was a great way of acknowledging and celebrating what we are doing and what is changing, but also realizing that there is still much important work to be done together. Our Teaching and Learning team will be offering more workshops to follow up on the one this week, please keep an eye on Sangha to find out more. I look forward to meeting with parents at our next Director’s Breakfast. Stay tuned for updates. Thank you to the parents who were in attendance and actively engaged in this enriching conversations as well as the Teaching and Learning team for their presentations. And of course special thanks to the wonderful students who came and shared their experience with us all.